G-NIUS Unmanned Ground Systems (UGS) Ltd., a joint venture of Elbit Systems and Israel Aerospace Industries (IAI), announced today that it was awarded a contract for the development of the next-generation UGV (unmanned ground vehicle) for the Israeli Defense Forces. The development phase, led by the Israeli Ministry of Defense's Administration for the Development of Weapons and the Technological Industry (MAFAT) and the Israeli Ground Forces, is to be completed by 2011. 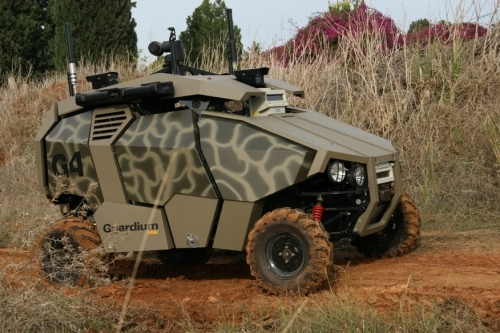 The "Nahshon" UGV is based on the vast experience of the G-NIUS UGV Guardium™, operated by the IDF since 2008. The next-generation UGV will offer improved autonomous movement and operational performance. Additionally, the vehicle's navigation capabilities will be intensified and will include various advanced control solutions. The new UGV will allow increased payload weight, in order to offer better situational awareness, autonomity and independent decision making. The features of the new UGV will enable higher operational flexibility and allow activity in various combat scenarios. These advanced capabilities will also allow the vehicle to provide combat support, along with the Guardium™ which operates mainly in security missions. G-NIUS CEO Erez Peled noted that the decision of the Israeli Defense Forces to develop a next-generation UGV reflects the necessity for such a system and its major contribution to security missions in the modern combat arena. Peled added that the Israeli Defense Forces is one of the most advanced armies worldwide in the unmanned systems field, and trusts that other armed forces around the world will follow the IDF in its selection of G-NIUS' unmanned systems. G-NIUS Unmanned Ground Systems (UGS) Ltd., a leading Israeli unmanned ground systems company, is an equally shared joint venture of Israel Aerospace Industries Ltd. and Elbit Systems Ltd.
G-NIUS develops and supplies a variety of autonomous unmanned ground system solutions, which are based on a common, versatile and layered avionics suite and apply emerging technological breakthroughs in navigation, control theorem, artificial intelligence and 3D artificial imaging. G-NIUS' customer base includes military, homeland security and law enforcement organizations.